I'm not sure what's rarer - an Essex Isabelline Shrike or finding myself with a free afternoon? 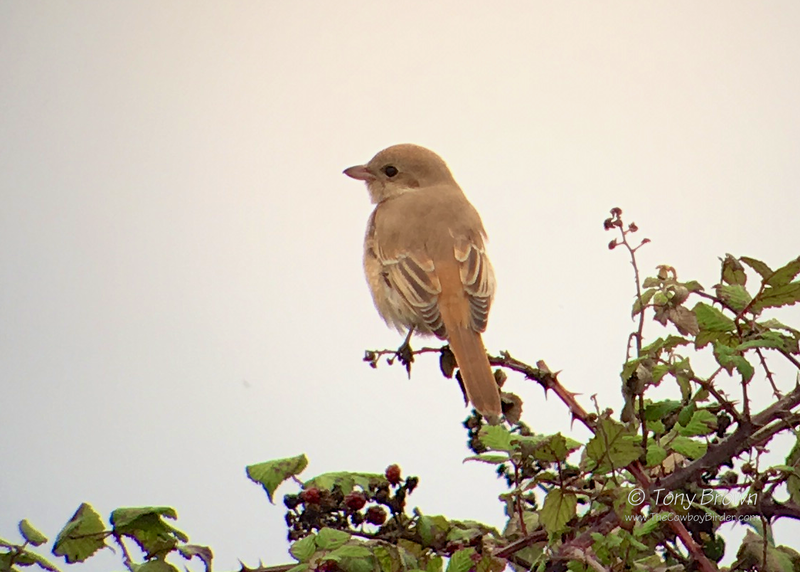 Well, as it's been 28 years since the last Izzy Shrike to grace Essex I think the bird just about wins! But as free afternoons go, it doesn't get a lot better than spending it watching a feisty Shrike catching and then devouring dragonflies - if only Friday afternoons were always like this. This was my first visit to Hythe Lagoons and from what I saw of it, it looks like a cracking little nature reserve on the River Colne, and being close to Colchester on the A12 it also meant I only spent just over an hour in the car to find the site - which is my kind of twitch. Parking was free along Haven Road in the industrial estate and then it was a short 10 minute walk along the river to view the bird from about 30 metres adjacent to the lagoon. Unfortunately the bird was just out of reach using the SLR camera, however I can't complain with my handheld digiscoped effort below - not bad for a record shot of this stunning 1st-winter performer, lets hope Essex doesn't have to wait another 28 years for the next one! 1st-winter Isabelline Shrike, Hythe Lagoons.